I am on a personal mission to fill The Great Hall with as many friendly people as possible on March 14 to benefit Fort York Food Bank. Who wants to hit the dance floor to help our neighbours out? Recently, Shedoesthecity has been working with the YWCA on an initiative called Day of Big Change. The day is about getting young Canadian women involved with a cause in their community that is close to their heart. I have been so inspired by the young women who have shared their plans with us, that I decided to roll up my sleeves and do the best I can to promote an event that is important to me. Prompted by generous donations from local individuals, The Lucky Ball is an inaugural event that has been organized quickly to benefit Fort York Food Bank (located at Dundas and Bathurst). Brendan Canning of Broken Social Scene will DJ, and Heineken quickly jumped on board to sponsor the event. 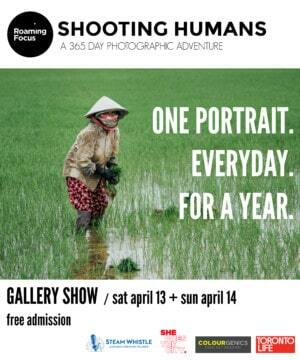 This will surely be a fun party where all proceeds raised will go towards the FYFP (Fort York Food Program). The FYFP provides low-income individuals and families in Toronto’s west-end neighbourhood with a three-day supply of groceries. There is rarely a time when I step outside my house, be it a jaunt to a local coffee shop or walk with my dog Rocky, that I don’t cross paths with a member of my community who is begging for change. I don’t know what it’s like to be hungry and I don’t know what it’s like to have no money for groceries. I do know, however, that there is enough food in this town to go around and I am guilty of letting veggies rot in my fridge while others, a few blocks away, rummage through garbage bins. Beyond the people who can be easily identified as hungry or homeless, there are countless others that I surely pass on a daily basis who are also hungry: Struggling students, elderly residents with very little money, and local families barely getting by. The Fort York Food Bank serves 1,500 people a month with food baskets, warm meals, and counseling help. It has been named one of Charity Intelligence’s recommended charities for the past four years and almost 20 percent of their clients are single-mothers. FYFB is a member agency of the Daily Bread Food Bank; their assigned service area covers the Westside of downtown Toronto, from Yonge to Dovercourt, Lake Ontario to Bloor. Is this your neighbourhood? Together, if we can sell out the tickets, we will raise $35k for the food bank. This amount of money would cover 20 percent of the food bank’s annual operating budget and feed thousands of Toronto families. 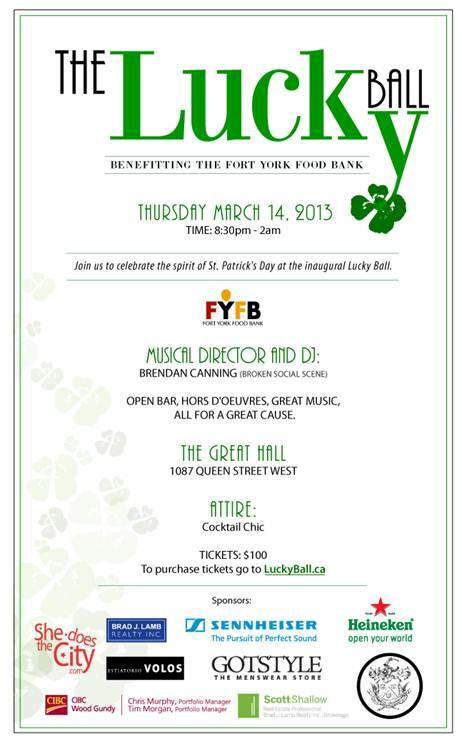 The Lucky Ball at The Great Hall, 1087 Queen St. W.
100 percent of the proceeds go towards the Fort York Food Bank.